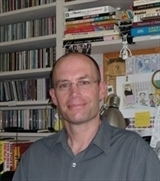 Lincoln Peirce is a cartoonist/writer and the creator of the comic strip Big Nate. It appears in more than two hundred U.S. newspapers and online daily at comics.com. In our exciting interview, Lincoln opens up and shares where does he get the inspiration for his stories and characters, His experience of creating the successful Big Nate comic strip, and the Big Nate novels, writing for animations that appear on Cartoon Network, his graphic novel for kids titled Max and the Midknights, upcoming projects and much more. Tune in and Join Max’s quest to become a knight in this laugh-filled, New York Times bestselling adventure from the author of the Big Nate series! Lincoln Peirce (pronounced “purse”) is a New York Times bestselling author and cartoonist/writer in Portland, Maine. He lives with his wife and two children and gives lectures to students about cartoon creating. Peirce is the creator of the comic strip Big Nate, that debuted in 1991 and appears in 250 newspapers in the US and online daily at www.comics.com, and is featured on the website Poptropica, www.poptropica.com. His is the author of Big Nate: In a Class by Himself and Big Nate: Strikes Again, the first two books in the Big Nate series, and BIG NATE FROM THE TOP, a collection of the most hilarious BIG NATE comic strips (Andrews McMeel, Fall 2010 pub). Lincoln Peirce was born in Iowa, earned a B.A. from Colby College, a Master’s Degree in drawing/painting from Brooklyn College, studied at the Skowhegan School of Painting and Sculpture, and has also taught art Xavier High School in New York. A fan and collector of classic country music, Lincoln also hosts a radio show called South by Southwest, dedicated to honky tonk and western swing, from 8:30 to 10:30 every Monday morning on WMPG (a community radio station in Portland, Maine). A huge thrill of his was interviewing Willie Nelson on board his tour bus a few years ago. Finally, where can we find Lincoln Pierce on the internet? You can visit him online at www.bignatebooks.com, where Lincoln blogs twice a week. Grab your copy of Max and the Midknights at Amazon! More about Lincoln Peirce, a cartoonist/writer and the creator of the comic strip Big Nate. How did Lincoln happen to be an author and an illustrator? Shifting from Big Nate’s contemporary world to the 14th century is a notable leap! What inspired Lincoln’s choice of setting for Max & the Midknights? What kind of conversations families can have after reading Max and the Midknights? An exclusive Sneak peeks into Max’s second adventure & much more. Thank you, Lincoln, for joining us and for sharing your wonderful graphic novel with us!